The WWE franchise is always faced each year with the task of justifying it's purchase. As is seen with WWE, the key is iterative development as opposed to an overhaul of its foundations. This year is another successful leap for the WWE 2K series with the release of WWE 2K17. Unfortunately, some fans are disappointed by the modes added in the 2K17 edition. The important thing is how the game plays which makes it the best released version thus far. The pace of the game has been slowed down so as to make each attack feel like it hurts. For example, the impact of a bodyslam as the bodyslamee is thrown to the ground is very vivid. Regardless of the punishment meted out, the wrestlers always seek to make their maneuvers look good. Surprisingly, the "roll out" feature has been included in this year's edition of WWE. It allows the player roll out of the ring after a beating. You have to wait a while before you can return into the ring. The waiting time can be reduced but a bit of stamina is lost which could eventually be your undoing since you are returning into the ring in a weak state. In the past, multiplayer matches have been messy in that AI opponents could easily break up a pin making the match last very long. Fights with friends also seemed impossible to win as a result of this. It was very easy to interrupt a seeming winning cover. This time around because every impact takes a physical toll on your fighter's body every move counts. This has an effect on determining the outcome or winner of the fight eventually. Hence, wrestling truly feels like wrestling. The showcase mode has served as the game's single player over the past few years. But the company has made the decision to scrap it in order to concentrate on other areas and this has been the right choice. My Career and My Universe haven’t filled the core experience void. For someone who wants to get into the thick of things neither My Career and My Universe would do because they both require much time and effort. The fact that you have to create a wrestler and begin to hone your skills is too tasking. Some prefer just to enter the shoes of a ready-made wrestler which is a lot more accessible. 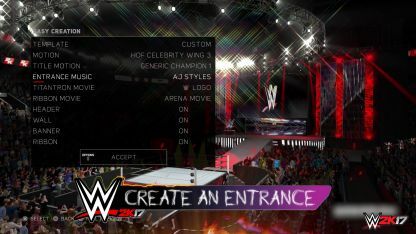 For those who prefer the My Career and My Universe modes, the creator options allows accurate creation of all kinds of wrestlers who have not officially made it into the game. WWE has also incorporated the promo mode in 2K17. It entails interviews which is a crucial leap in the right direction. A list of dialogue options is presented to you. You have to choose the ones that match correctly to the personality of your character. It’s a first and a decent one at that. It is not as elaborate as expected but as a work in progress for the franchise one can only hope of better improvements in upcoming releases. This may be disappointing to some but a good promo can be as entertaining as a good match. We will all benefit from this if the WWE franchise is able to capture this better in the future. Apart from all the features mentioned and explained in some detail, WWE 2K17 is not too different form the previous series. You have backstage brawls and roster. This year's roster is the biggest ever which allows for a bigger number of potential matchups. It will be intriguing to see what WWE 2K18's main attraction will be. But till then, 2K17 should sufficiently engage you. Thus far, WWE 2K17 is the best wrestling game in the current console generation as it introduces some new features that should become highlights over time. A complete overhaul sometime in the future would not be out of place. It will be good to see what WWE 2K is capable of with a fresh slate. The new additions here are all greatly welcome and executed properly. Sadly, the absence of the showcase mode is disappointing but the pros outweigh the cons for this year. Crazy about and for JESUS CHRIST. Enjoy good poetry and a good game of Chess.